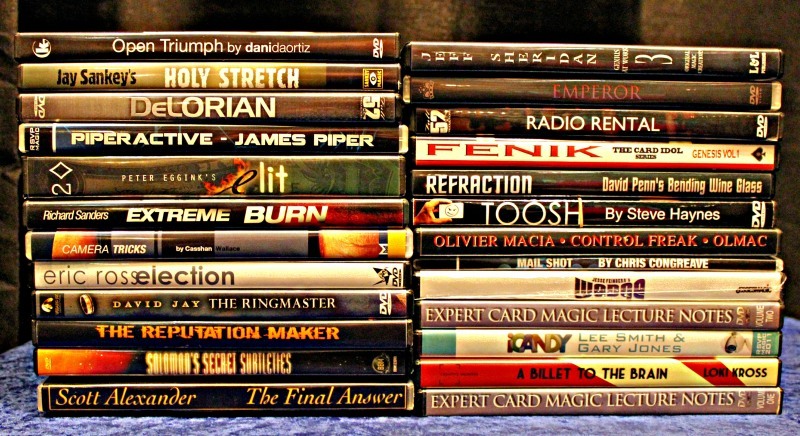 New additions to our range of recycled magic DVDs. All are in good condition and come complete with props and/or gimmicks where appropriate. New price in brackets, our price afterwards (normally 25% off, unless I got an especially good deal from the seller). All prices plus postage at cost. ALEXANDER, SCOTT. The Final Answer. Kohler, 2 DVDs & gimmick. (£40.00) £30.00. BANNON, JOHN, & MONTIER, LIAM. Fractalicious. BBM, with props. (£20.00) £15.00. BANNON, JOHN. Smoke & Mirrors. MyMagic. 90 minutes. (£25.00) £18.75. EGGINK, PETER. eLit. With gimmick. (£30.00) £22.50. FENIK. Genesis Vol. 1. DV Magic (£20.00) £15.00. FORREST, DAVID. DeLorian. Full52, with props. (£13.50) £10.13. FORREST, DAVID. Radio Rental. Full52. (£25.00) £18.75. JAY, DAVID. The Ringmaster. WizardFX (£40.00) £26.25. JONES, GARY, & CONGREAVE, CHRIS. Automata. Full52. (£22.00) £16.50. MACIA, OLIVIER. Control Freak. Camirand.,81 mins. (£12.99) £9.74. MO & RYU-KA. Emperor. (£28.00) £21.00. NORMANSELL, ANDREW. Xpresso. MagicWorld, with props. (£15.00) £11.25. PIACENTE, SAL. Expert Card Magic. MagicMakers (£25.00) £18.75. PIPER, JAMES. Piper Active. RSVP (£15.00) £11.25. ROBSON, HARRY, & WRIGHT, MATTHEW. The Reputation Maker. (£25.00) £18.75. ROSS, ERIC. Election. Paper Crane. (£15.00) £11.25. SANDERS, RICHARD, & ABBOTT, BILL. Power Ball 60. With props. (£20.00) £15.00. SANDERS, RICHARD. Extreme Burn. With gimmick. (£25.00) £18.75. SMITH, LEE, & JONES, GARY. iCandy. RSVP (£20.00) £15.00. SOLOMON, DAVID. Secret Subtleties. BBM (£30.00) £22.50. SOMA. The Social Deck. With deck. (£34.00) £25.50. SOUTHWORTH, MARK. Cash Vault. Illusioncraft, with props. (£12.50) £9.38. SOUTHWORTH, MARK. The Changer. Illusioncraft, with props. (£25.00) £18.75. WALLACE, CASSHAN. Camera Tricks. Murphy, with gimmicks. (£25.00) £18.75. Stocks are limited, of course, so ring or email before ordering. Thanks. It’s been a few years since I lectured for the Sheffield Magicians. I’ve got a. Ew lecture called Secrets – full of very cool stuff I use myself including routines with my Secret Servante utility device. My fee is just £150 plus accommodation- let me know if you’d like me to pop along again. I shall pass your information to the SCM entertainments secretary for furture reference.